Depp deals the dish on his new drug trafficking drama. Most articles about actor Johnny Depp rehash how American audiences first came to know him from his role on the Fox television drama, 21 Jump Street, where Depp played undercover cop Tom Hanson from 1987 to 1990. True cinephiles however, will point out that Depp had already begun to gather a small following after appearing in tiny roles in 1984’s Nightmare on Elm Street and 1986’s Best Picture Oscar winner, Platoon. After 21 Jump Street folded, the movie that launched Depp into cinematic stardom was Tim Burton’s Edward Scissorhands. As the boy with the metallic touch opposite his then-girlfriend, Winona Ryder, Depp’s poignant performance helped make the quirky film a huge hit. In the next decade the actor would work with Burton on two other occasions; in Ed Wood in 1994, and as Ichabod Crane in 1999’s Sleepy Hollow, an adaptation of the Washington Irving story. Indeed, Depp’s work with Burton remains some of his most memorable, while movies such as Nick of Time, The Ninth Gate, and The Astronaut’s Wife left both industry insiders and fans wondering exactly what the actor could have been thinking when choosing to participate in the projects. Yet amidst the duds, there have been a number of beloved films, like What’s Eating Gilbert Grape, Benny & Joon, Dead Man, and Don Juan DeMarco, as well as critical hits along the lines of 1997’s Donnie Brasco and 2000’s Before Night Falls. Depp’s latest film Blow, directed by Ted Demme, tells the true story of George Jung, a convicted drug smuggler who helped create and supply the market for cocaine during the 1970s. The film follows Jung’s story, beginning with his childhood in Boston, through his early years trafficking in marijuana and his crossover into importing Colombian cocaine before his eventual arrest and conviction by federal authorities. On a Sunday in mid-March, Depp met with reporters at a West Hollywood hotel to discuss his most recent movie, his career, and his life. You have been quoted as saying, “Anything I’ve done up until the 27th of May, 1999 was an illusion. The birth of my daughter gave me my life.” That’s interesting because your character in Blow experiences a similar epiphany when his own daughter is born. That’s not too far off the mark, but I think it’s a pretty universal feeling for anybody who is blessed with that moment where you meet your child for the first time. What went through your mind when you met your daughter for the first time? Well, for me, and I’ve never been one of those self-obsessed “woe-is-me” type guys, it was the first moment in my life, a really welcome moment, where I was totally selfless. It was no longer about me. And anything that I had ever gone through in terms of life experiences was just insignificant next to that. Just completely didn’t exist. How are you doing as a dad? I think I’m doing okay. She hasn’t thrown me out yet. What is the first movie of yours that you will let your daughter see? What does it take to get you to say “Yes” to a project now? It makes it difficult to leave home, especially when you are surrounded with all that beauty, with my girls. But first you gotta bring home the bacon. You know, keep the paychecks coming. Really, it just depends on the project. When the Hughes brothers came to me with the idea of doing From Hell, there was no way to avoid it, it was just such a golden opportunity. Same thing with Blow. These were once-in-a-lifetime opportunities. A lot of it also has to do with just timing it out properly so there is never too long of a time away from my daughter or away from my family. The most we’ve ever gone is, like, 17 days. And after 17 days, I was ready to chew my own hand off. You just go crazy. So now it’s gotta be a great thing with great filmmakers, and I have to be able to work out the timing, so I can be with my family as well. 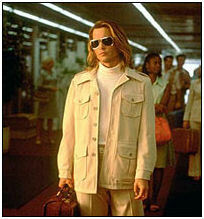 Can you relate to what George Jung goes through in the film, in regard to fast fame and fast money? Can you remember what it was like back in the days before 21 Jump Street and was that better than this? Was it better? No. This is the happiest I have ever been in my life. The most content I have ever been in my life and I think the most together I have ever been in my life. What I did have back then, maybe a little more than I do now, was anonymity. And my life was a bit more simple before Jump Street came out into television. But no, there was some rough going there. Now and again, I can remember not being able to pay my rent and cashing bad checks and suddenly Allah or somebody sent me a residual check. Having had the experience of making this film, what do you know or what have you learned about the drug trafficking trade that most people might not know? Well, I do know that if we have a drug problem in this country, which we do and we have had for many years—it’s pretty well-known and it has been documented here and there—that some of the top brass in the upper echelon of government and people in high places have allowed the drugs to come into the country. I know that when Carlos Leder was busted in the ‘70s or early ‘80s, there was an open letter published in the New York Times, which was written to President Bush, because . 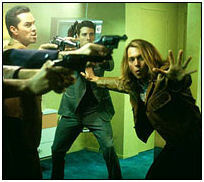 . . the character Diego Delgado in Blow is based on Carlos Leder. So I do know that about the drug trade. I know it ain’t just the people like George. I’m not that naïve. Oh yes. I’ve seen the demon here and there. Did you get to meet George? He was a lot of things. He’s a complicated guy. But first and foremost—what I was really happy to find out—was he is just as human as can be. There is no evil. There is no malice in him. He’s not greedy. He’s just a good man who recognized his mistakes and has to live with his sort of devastation every day. I saw a strong guy when I met him. He’s a very strong, kind of ironic, funny, broken man. Does he feel like a victim? I think he feels more responsible. But I mean from the outside looking in, I see him as more of a victim. I see him as a victim of his own upbringing, the kind of pressures and expectations that were placed upon him as a kid. He became what he became because his parents made him what he is. Is Blow making a commentary, like Traffic, or is it just a biographical movie? I haven’t seen Traffic, but I think Blow is just a look at this one man’s life—what he went through and why he went through it. Drug smuggling was his business. He earned a lot of money and thought that that was going to be the answer to all his prayers, and, in the process, lost it, lost his family. He lost because he won. Is he looking forward to getting out? If his daughter doesn’t want to see him, what else is there for him on the outside? Well, for George, on the last bust, when he was sentenced to go to prison, there were a few people busted in the same place, same circumstances, same charge as George. And the other people were given two years, I think, which, in a federal penitentiary, you do a minimum of 74% of your sentence. They’re looking at two, maybe three years maximum. George got 25 years. He got sentenced to that, because he, for all intents and purposes, had made a fool out of the judge and the local cops [previously]. It was the feds who busted him before and not the local cops, so they said, “Okay we got Jung finally, whammo!” So, I think it was kind of unjust, really, his sentencing. What’s outside? My opinion is that George has served his time and paid his debt to society. He’s not doing anyone any good rotting away in a prison cell. The guy is rehabilitated. And I’m not sure the system rehabilitated him. I think he rehabilitated himself based on the hideous thoughts he’s has to live with and realities he has had to deal with. I think he has paid his debt to society. I think he could do much more good on the outside. He’s doing work with the DARE [Drug Abuse Resistance Education] program right now. He could, potentially, go on the road with DARE and teach kids the dangers of drugs. And he could also pay his debt to his daughter and try to give her a father. The scene where he gets busted in Chicago and he is giving a hard time to the judge, you can kind of see what he is saying: “Why is this criminal?” Does he still think of himself as a pioneer? I don’t know how proud he is of that. When you look at the way George said that, “What did I do? I crossed an imaginary line with a bunch of plants.” He’s got a really good point. There is no question about it. It is a very valid argument. It just so happens that, like the judge says, “These are the rules, imaginary line or not, these are the rules.” I think, at that point in his life he was feeling pretty cocky. He was starting to believe his own press at that point. What is your take on that? Do you think marijuana should be legalized? Look, I have nothing to hide. I’m not a great big pothead or anything like that. I might socially, or whatever, have a couple of drinks here and there, but weed is much, much less dangerous than alcohol. Alcohol can make people aggressive. Certainly, statistically with car accidents, alcohol is a big killer. It’s pretty rare that you hear of a car accident happening because a guy was stoned. Or a guy who went out and started a huge fight because he had one too many puffs on a joint. You know, so it’s like prohibition. What happens with marijuana is like what happened back when prohibition was put into effect. Say there were, like, 100 bars in a city. The following week there were 2,000 bars, and people who had never taken a sip of alcohol were all of a sudden guzzling bathtub gin. And it’s like that for kids. The minute you say, “Don’t ever do this, stay away from this,” they are gonna go, “You’re right. I won’t,” and they are gonna walk right out the door and try to score a nickel bag.